After nearly two centuries of neutrality, Switzerland became the 190th member of the United Nations on Tuesday with the unanimous support of the General Assembly. The admission of Switzerland was one of the first orders of business at the opening of the new session of the General Assembly. Delegates burst into applause when the new assembly president, Czech Foreign Minister Jan Kavan, declared Switzerland the 190th member. French Foreign Minister Dominique de Villepin, on behalf of Switzerland's five neighbors, recommended its application for membership. "The role of Switzerland is now crucial on issues of development, international law and human rights," he said. "The entry of Switzerland will strengthen the United Nations." De Villepin noted that Switzerland was the only nation to decide to join the United Nations after a popular referendum, which would strengthen "the democratic premise of our organization." At the end of the French minister's speech, Kavan asked whether the General Assembly would accept the recommendation for Switzerland's membership "by acclamation." When delegates burst into applause, Kavan banged his gavel and said, "I therefore declare the Swiss Confederation admitted to membership in the United Nations." Earlier Tuesday, Swiss President Kaspar Villiger said his country's entry into the United Nations would not compromise its traditional neutrality. 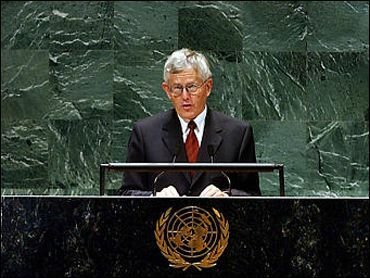 "We can be neutral and be a good member of the United Nations," said Villiger. "The values and aims of the United Nations are also the values and aims held by Switzerland." In a Swiss referendum in March, 55 percent voted in favor of U.N. membership, heeding a government campaign that said rejection would be disastrous for the country's international standing and that neutrality had lost much of its meaning. Villiger also reiterated support for the fight against terrorism, pointing out that Switzerland was focusing on how to crack down on the funding of terrorist crimes. "We are all called upon to contribute to the fight against international crime and terrorism," he said. "This is why Switzerland has redoubled its efforts in this fight." Switzerland's membership in the United Nations will actually not change much in practical terms. The country already is an active member of specialized agencies like the World Health Organization, International Labor Organization and U.N. High Commissioner for Refugees.